Home/Ford Crown Vic Taxi with RunCool Hood Louvers! My taxis travel 100,000 miles a year! I’m in my third year now with this Ford Crown Vic. . . I now have 328,000 miles on this taxi. . . I need to get as much life out of this engine as I can. What is the worst enemy for an engine? HEAT! How do I extract the heat out?? a hood scoop? No, that is only good if the vehicle is moving! Driving with the hood ajar on the second safety latch? No, been there, done that. . . I need hood louvers!. . . yes, cut a big hole in the hood, cap it off with stylish hood louvers, so the heat will exit regardless if the car is stationary, or moving. I know that taxi cabs run longer and harder than police cars — even if a police car is running a tri-shift (24 hours a day), the taxi cab is running a 12 hour double shift, which is the same. 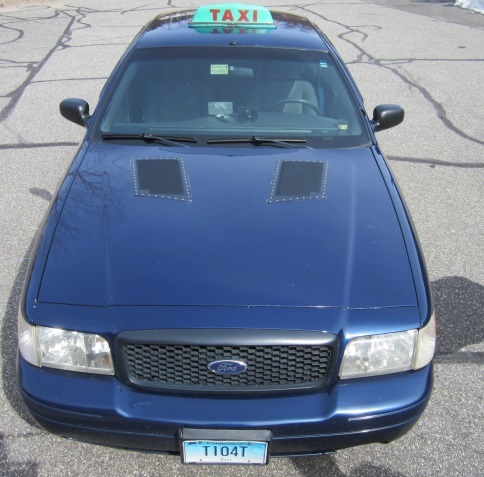 However, the difference is that the taxi cab is under a stress load of acceleration for the full 24-hour shift. I want to purchase another set, the same size as this one for one of my cabs.Thanks! Jay L., General Manager, New Haven/Milford Taxi, Owner of West Haven Cab, West Haven, Conn.